The Turkish Land Forces (Turkish: Türk Kara Kuvvetleri), or Turkish Army (Turkish: Türk Ordusu), is the main branch of the Turkish Armed Forces responsible for land-based military operations. Official claims state that the army was founded by Modu Chanyu in 209 BC, but the modern history of the army began with its formation after the collapse of the Ottoman Empire. Significant events since the foundation of the Army include combat in the Korean War and in the 1974 Turkish invasion of Cyprus, and acting as a NATO bulwark along Cold War frontiers through 1992. The army holds the preeminent place within the armed forces. It is customary for the Chief of the General Staff of the Republic of Turkey to have been the Commander of the Turkish Land Forces prior to his appointment as Turkey's senior ranking officer. Alongside the other two armed services, the Turkish Army has frequently intervened in Turkish politics, which has now been regulated to an extent with the reform of the National Security Council. The current commander of the Turkish Land Forces is General Salih Zeki Çolak. As of late 2015, reports suggest the Turkish Army (along with the rest of the Armed Forces) have seen their personnel strengths increase to similar levels of the 2000's. Factors contributing to this are further destabilization of Syria and Iraq due to ISIS and the Russian intervention in Syria, as-well as the re-emergence of a PKK insurgency in Turkey's south east. Aside from the sheer size of the Turkish Army it is noted that the Army maintains a robust, highly combat-ready and disciplined structure. Bordering some of the most dangerous and troubling regions of the world. Combating a restive two-front conflict in south-eastern Turkey against prolonged Kurdish PKK insurgency near the rugged terrain of the mountainous Iraqi border regions and secondly successfully maintaining border security against ISIS, Russian Military Aggression from Syria, Kurdish YPG as-well as multiple other elements along with participation in ISAF has contributed to the Turkish Army in terms of extensive combat experience onto an already professional military heavy-weight. On 28 June 1963, the Turkish Army celebrated the 600th anniversary of its foundation. Back then, the accepted theory was that the Turkish Armed Forces had been founded in 1363, when the Pençik corps (the predecessor of the Janissary corps) had been formed. In the same year, one of the prominent Pan-Turanists, Nihal Atsız, asserted that the Turkish Army had been founded in 209 BC, when Mete Khan of the Xiongnu is thought to have formed an army based on the decimal system. In 1968, Yılmaz Öztuna proposed this theory to Cemal Tural, who was the Chief of the General Staff of the Republic of Turkey at the time. In 1973, when the Turkish Army celebrated the 610th anniversary of its foundation, Nihal Atsız published his claim again. After the 1980 Turkish coup d'état, the Turkish Army formally adopted the date 209 BC as its year of foundation. The modern Turkish Army has its foundations in nine remnant Ottoman Army corps[lower-alpha 1] after the Armistice of Mudros at the end of World War I. After the rise of Turkish resistances (Kuva-yi Milliye) in Anatolia, Mustafa Kemal Pasha and his colleagues formed the Grand National Assembly (GNA) in Ankara on April 23, 1920, Kâzım Pasha's XV Corps was the only corps which at that time had any combat value. On November 8, 1920, the GNA decided to establish a standing army (Düzenli ordu) instead of irregular troops (Kuva-yi Milliye, Çerkes Ethem's Kuva-yi Seyyare etc.). Mareşal Kemal Atatürk as the Supreme Commander of the Turkish Armed Forces. Mareşal Kemal Atatürk and General İsmet İnönü before the Battle of Dumlupınar in 1922. Commanders of the Turkish Army during the Turkish War of Independence. Turkish soldiers in a trench waiting for the order to attack with fixed bayonets on their rifles. On August 26, 1922, the Army of the Grand National Assembly (Büyük Millet Meclisi Ordusu) launched the general offensive known as the Great Offensive (Büyük Taarruz) against the Greek forces around Kara Hisâr-ı Sâhip. Nurettin Pasha's 1st Army and Yakup Şevki Pasha's 2nd Army encircled the main body of Major General Nikolaos Trikoupis's group and defeated it near Dumlupınar. Fahrettin Pasha's V Cavalry Corps entered Smyrna (Izmir) on September 9, 1922. Şükrü Naili Pasha's III Corps entered Constantinople (Istanbul) peacefully on October 6, 1923. Subsequently to the founding of the Republic of Turkey, the Army of the GNA was reorganized into three army inspectorates (ordu müfettişliği, 1st, 2nd and 3rd army inspectorate). Mareşal Fevzi Çakmak, who, together with Atatürk, commanded the Great Offensive in 1922. General Kâzım Karabekir was the Commander of the XV Corps. General Fahrettin Altay was the Commander of the V Cavalry Corps. In 1935, Turkey purchased 60 T-26 mod. 1933 light tanks from the USSR (also, two twin-turreted T-26 mod. 1931 were presented to Turkish government in 1933–1934), along with about 60 BA-6 armoured cars to form the 1st Tank Battalion of the 2nd Cavalry Division at Lüleburgaz. The Armoured Brigade of the Turkish Army consisted of the 102nd and the 103rd Companies armed with the T-26 mod. 1933 tanks (four platoons in a company, five tanks in platoon) in the end of 1937. The reserve group of the brigade had 21 T-26 tanks also. In the beginning of 1940, the Turkish Army had the Armoured Brigade in Istanbul, which belonged to the 1st Army, and the 1st Tank Battalion, which belonged to the 3rd Army. Turkish T-26 tanks were taken out of service in 1942. During World War II, Turkey mobilized more than a million personnel. The Turkish Army order of battle in 1941 shows a number of formations. The command of the Turkish Army was formed on July 1, 1949 and Nuri Yamut was appointed as the first commander of the Turkish Army. The Turkish Army participated in the Korean War as a member state of the United Nations, suffering 731 deaths in combat out of the 5000 soldiers of the Turkish Brigade there, which fought at battles of Kunu-ri (Kunu-ri) where it was credited with saving the U.S. 2nd Infantry Division from encirclement. The brigade also fought at Gimnyangjang-ni (Kumyangjang-ni), 'Operation Ripper,' or the Fourth Battle of Seoul, and Vegas ("Vegas"). After Turkey joined NATO on February 18, 1952, the government initiated a comprehensive modernization program for its Armed Forces. In July 1974, Turkey intervened in Cyprus, following a coup organized by EOKA-B and led by Nikos Sampson who ousted the democratically elected Cypriot President Archbishop Makarios III in order to establish Enosis (Union) between Cyprus and Greece. The coup was backed by the Greek military junta in Athens. The 1974 Turkish military operations in Cyprus can be divided into two distinct Turkish offensives, the first being "Atilla 1", which commenced in the early hours of July 20, 1974, with an amphibious landing force, directed by the 6th Corps, forming a beachhead at Kyrenia's Five Mile Beach. It comprised only infantry troops, but was supported by rolling air and naval artillery attacks, and met with limited resistance from the Cyprus National Guard, which was in disarray as a result of the July 15, 1974 coup. The majority of fighting ceased on the 23rd of July, though sporadic clashes continued after this date until the 14th of August. "Atilla 1" successfully achieved its objective of forming a bridgehead with the Turkish Cypriot enclave of Agyrta-Nicosia. The second Turkish offensive began on August 14, 1974, as Greek and Turkish Cypriot representatives met in Geneva to discuss the situation on the island. Turkish pleas for international intervention having failed and very slow diplomatic progress, in addition to being confined to an undefensible and non-viable region in Cyprus, Turkish Armed forces took action again. Despite a UN ceasefire in place (several had already been disregarded), the Turkish Army, massively reinforced from weeks of build-up, launched an all-out surprise attack on ill-prepared Greek Cypriot and Greek units. 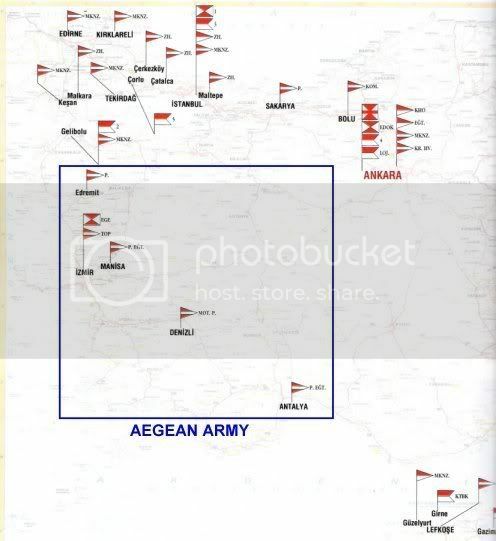 With little answer to the masses of armour, mechanised units, artillery and air support that the Turks could bring to bear, virtually all Greek Cypriot defences collapsed in a matter of days, and by August 16, 1974, Turkish forces, spearheaded by the 28th and 39th Infantry Divisions, had extended to capture some 37% of the island, including the towns of Famagusta, Varosha and Morphou. The conflict in Cyprus resulted in the de facto division of the island between the Turkish Cypriot controlled north and the Greek Cypriot controlled south. Turkey still maintains troops in Cyprus, since a political solution could not yet be achieved and since many members of the Turkish Cypriot community fear a return to the intercommunal violence which occurred between 1963 and 1974. Selimiye Barracks (1828) in Istanbul is the headquarters of the First Army of the Turkish Land Forces. According to official British military reports in 1974, the Turkish Army included the First Army (2nd, 3rd, 5th, and 15th Corps), Second Army (4th, 6th, and 7th) and Third Army (8th, 9th and 11th Corps). There were also three Interior Zones with three recruit training divisions and four recruit training brigades. For a long period, these formations were grouped under the NATO headquarters Allied Land Forces Southeastern Europe (LANDSOUTHEAST) in Izmir, led by a Turkish Army four-star General. After the fall of the Soviet Union the headquarters became Joint Command Southeast for a period, before becoming Allied Air Component Command Izmir in 2004. In 1981-82, the Army had one armoured division, two mechanised infantry divisions, and fourteen Infantry Divisions, with 3000 M47 MBTs, 500 M48 MBTs, as well as 70 Leopard 1A3 on order, for a total of 3570 tanks. Until the dissolution of the Warsaw Pact in 1990, the Army had a static defense mission of countering any possible attack on Thrace by Soviet and Warsaw Pact forces and any attack by the Soviet Transcaucasus Military District on the Caucasus frontier. The Third Army was responsible for holding the Caucasus line with about one third of the Army's total strength of one armoured, two mechanised, and fourteen infantry divisions (1986 data). Nigel Thomas's NATO Armies 1949-87, published in 1988, attributed the 2nd, 3rd Corps, 5th, and 15th Corps to the First Army; the 6th and 7th Corps to the Second Army, the 4th, 8th, and 9th Corps to the Third Army, and the 11th Corps to the Aegean Army. He wrote that the 11th Corps comprised the 28th and 39th Divisions. When the General Staff attempted to shift 120,000 troops to the frontier with Iraq in 1990, they discovered, the writers of the U.S. Library of Congress Country Studies said, that there were serious deficiencies in the Army's ability to respond to crises that could erupt suddenly in distant regions. Towards the end of the 1980s, a restructuring and modernization process has been initiated by the Turkish Armed Forces, which still continues today. The final goal of Turkey is to produce indigenous military equipment and to become increasingly self-sufficient in terms of military technologies. Gen. Büyükanıt, who sent crucial messages regarding the future of the Land Forces, said that the country's own instabilities should also be taken into consideration. He reported that the land forces will shrink considerably within the next eight years. But he said that despite this process, the force's capacities will be increased. "The Land Forces aim at being equipped with new opportunities and capabilities in order to carry out its duty in full strength against a large variety of threats, varying from classical threats to asymmetrical ones. "The targets for our land forces are to be realized through 'Forces 2014' project. This project aims to shrink the forces without undermining its combat capabilities. On the contrary, under the plan the efficiency of the force will increase. At present, the primary main battle tanks of the Turkish Army are the Leopard 2A4 and the M60T. There are also around 400 Leopard 1 and 750 M60 Patton variants in service (excluding the M60T which were upgraded with the 120 mm MG253 guns), but the Turkish Army retains a large number of older vehicles. More than 2,800 M48 Pattons are still in service (upgraded with the 105 mm M68 guns) though only around 1,300 of these are stored as reserve MBTs, while the rest are mostly transformed into other types of military vehicles (such as cranes, MBT recovery vehicles and logistical support vehicles) or used as spare parts resources. Turkey plans to build a total of 1,000 new Otokar Altay MBTs, in four separate batches of 250 units, with the MİTÜP Turkish National Tank Project. The tanks will be produced by the Turkish firm Otokar, and share some of the systems that are used in the K2 Black Panther main battle tank of South Korea. Turkey has signed an agreement with the US to buy six CH-47 Chinook helicopters, for $400 million. Because of financial constraints, however, the Undersecretariat for the Defense Industry, or SSM, Turkey’s procurement agency, later wanted to buy only six CH-47Fs, five for the Army and one for the Special Forces Command, leaving a decision on the remaining eight platforms for the future. Contract negotiations between the SSM, the U.S. government and Boeing were launched last year. The maximum length of compulsory military service has been reduced to a year. Turkey has chosen a Chinese defence firm to co-produce a US$4 billion long-range air and missile defence system FD-2000, rejecting rival bids from Russian, US and European firms. The Turkish defence minister announced the decision to award the contract to China Precision Machinery Import and Export Corp (CPMIEC) in a statement on Thursday, September 26, 2013. NATO has said that missiles should be compatible. Officer with formal uniform of General Staff. Soldiers with service uniform of Land Forces. Soldiers with Land Forces, Air Forces and General Staff ceremonial uniform. Soldiers with Naval Forces and Air Forces ceremonial uniform, with an officer who wears Naval Forces formal uniform. Turkish-built TAI Anka MALE UAV. The structure of the Turkish Army has historically had two facets: operational and administrative. The operational chain consists of the field fighting formations, and the administrative the arms and service branches - infantry, armour, artillery etc. The Turkish Army has since the mid-1960s operated on a corps-division-brigade system, with a varying number of divisions and brigades assigned to a corps. The IISS Military Balance 1966-67 recorded a total strength of 360,000, with 16 infantry divisions (14 NATO assigned), 4 armoured brigades (Zırhlı tugay) with M47 Patton tanks, armoured cavalry regiments, and two parachute battalions. At some point in the 1960s the Army apparently utilised the Pentomic structure for a period, before adopting the American ROAD divisional organisation. Back in the early 1970s, there was a 6th Infantry Division based at Istanbul. The army's 14 armoured brigades are the most powerful brigades in the restructured organisation; each includes two armoured, two mechanised infantry and two self-propelled artillery battalions. The 17 mechanised brigades each have two armoured, two mechanised and one artillery battalion. The army's nine infantry brigades each have four infantry battalions and one artillery battalion, while the four commando brigades have three commando battalions. From 1992 the Army began to change from a corps-division-regiment structure to a corps-brigade arrangement, with divisions remaining on Cyprus and for certain special other cases, such as for NATO's reaction forces. In accordance with NATO’s new strategy in the early 1990s, Turkey agreed to commit forces to NATO’s ACE Rapid Reaction Corps. 'Therefore, the decision was made to create a new division. Thus, the old 1 Inf Div which had been abolished many years ago was reactivated and renamed as 1 TU Mech Inf Div and attached to 4 TU Corps on 30 November 1993.’ This division was later disbanded, and appears to have been replaced within 3rd Corps by the 52nd Armoured Division, formed later on. The Military Balance, 1994-1995 also lists the following units: the Presidential Guard regiment, an infantry regiment, five border defense regiments (Brigades (? )), and twenty-six border defense battalions. The fate of these independent units under the reorganization remains unclear. In late 2002 the 3rd Corps, with its headquarters near Istanbul, was certified as one of the six NATO High Readiness Force-Land (HRF-L) headquarters and gained the additional title of the Rapidly Deployable Turkish Corps (RDTC). A year later, Jane's Defense Weekly reported on 9 July 2003 that as part of force restructuring, its four existing armies would be reorganized into a Western Army, in Istanbul, and the Eastern Army would replace 2nd Army in Malatya. This plan does not appear to have been carried out. The IISS and the Turkish Army's website give differing figures as to the number of formations in the Army. The official site gives totals of 9 Army Corps, 1 Infantry Division, 2 Mechanized Infantry Divisions, 1 Armored Division, 1 Training Division, 11 Infantry / Motorized Infantry Brigades, 16 Mechanized Infantry Brigades, 9 Armored Brigades, 5 Para-Commando Brigades, 1 Army Aviation Brigade, 2 Artillery Brigades, 5 Training Brigades and one Humanitarian Aid Brigade. The IISS Military Balance 2008 lists the Turkish Land Forces with four Army HQ, 10 corps HQ, 17 armoured brigades, 15 mechanised infantry brigades, two infantry divisions, 11 infantry brigades, 1 Special Force command HQ, five commando brigades, one combat helicopter battalion, four aviation regiments, three aviation battalions (totalling 1 tspt and 2 trng battalions), and four training/artillery brigades. The Turkish Army is organised into the following commands: The information below is unconfirmed and may be out of date; it seems likely now that the Training and Doctrine Command controls all the artillery and infantry training brigades. 39th Infantry Division - headquartered at Camlibel within the district of Girne. 14th Armoured Brigade - also in Asha (Paşaköy) with M48 Patton tanks. 1st Infantry Training Brigade (Manisa). OF3, OF2, & OR2 translate to "Head of 1000", "Head of 100", and "Head of 10" respectively. ↑ 3.0 3.1 Harp Akademileri Komutanlığı, Harp Akademilerinin 120 Yılı, İstanbul, 1968, p. 53. ↑ Sina Akşin, Essays in Ottoman-Turkish Political History, Isis Press, 2000, p. 44. ↑ Turkey, Office of the Prime Minister, Directorate General of Press and Information, 1993, p. 23. ↑ Andrew Mango, Turkey: Nations and Peoples Library New Nations and Peoples, Walker, 1968, p. 45. ↑ Turkish Armoured Forces. See also http://tankfront.ru/neutral/turkey/turkey.html. ↑ Savvas Vlassis, "O Aporritos Attilas", Doureios Ippos (2004). ↑ Intercommunal Violence and Eric Solsten, ed. Cyprus: A Country Study. Washington: GPO for the Library of Congress, 1991. ↑ John Keegan & Andrew Wheatcroft, Zones of Conflict: An Atlas of Future Wars, Jonathan Cape, p.20-21. ↑ Unification of Culture and Tourism Ministries constitutional One soldier killed, three injured in terrorist attack Minister Cicek says Turkey's credit, Turkish Daily News, October 17, 2003. ↑ Chief of the Army General Staff. This article incorporates public domain material from the CIA World Factbook document "2004 edition". This page was last modified on 13 January 2016, at 11:31.